Penguin Pursuit Contest - Clues for the first appearance! Get ready, the great Penguin Pursuit is on! At 12:30 pm today, folks finding the right place at the right time will have a chance to see a real penguin on the streets of Boston. You'll definitely want to find the penguin, not only because they're handsome and fascinating birds, but also because you'll have a chance to win Aquarium passes and more! Successful sleuths may also have a chance to get their picture taken with a live penguin who will be sightseeing in a fully enclosed air-conditioned cart, or with the newest Aquarium character. (Hint: The character will be the cuddly fellow dressed in black and white!) Educators will also be on the scene doling out interesting facts about penguins and handy bookmarks to everyone. Visitors will even have a chance to join our social networks on the spot. So are you ready? Do you have your thinking cap on? Here are all the clues that should help point you towards the penguin's location today. A gilded grasshopper weathervane sits atop this famous Boston building. A time capsule labeled "food for the grasshopper" was deposited inside of the grasshopper's stomach and includes historical newspapers, coins and messages from mayors. Because of protests here during the 1760's against British taxation policies, the meeting hall is dubbed the Cradle of Liberty. To better accommodate the merchants and shoppers, this hall was expanded in 1826 to include Quincy Market, named after Boston Mayor Josiah Quincy. This area was built by Boston’s wealthiest merchant, Peter Faneuil, as a gift to the city in 1742 as a central marketplace for crops and livestock. If you think you know where the penguin will be, get yourself to that location TODAY between 12:30 and 1:30 pm. Of course, you'll want to snap a photo of yourself and your family with the penguin. If you're the first person to send your picture to thingstodo@boston.com you have a chance to win four tickets to the Aquarium and Simon IMAX Theatre. But wait, there's more...your photo could also be displayed on Boston.com! One submission per person. 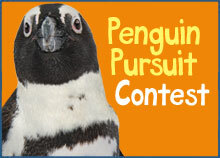 Visit the Penguin Pursuit Contest page on Boston.com for more information on submitting! If you can't spot the penguin in Boston today, do not despair! After today, there will be many more chances to keep up with the Penguin Pursuit throughout Boston as we celebrate this summer's exciting theme program—Penguin Power. So stay tuned, those clues are still to come!